Discover released an updated version of its iPhone app on Thursday that will enable cardholders to store and redeem eCertificates through Apples Passbook app. Version 4.10 of the Discover Mobile app allows cardholders to turn their Cashback Bonus rewards into eCertificates, which can then be stored in Passbook and used as a point-of-sale payment at a time and participating merchant of the customers choosing. 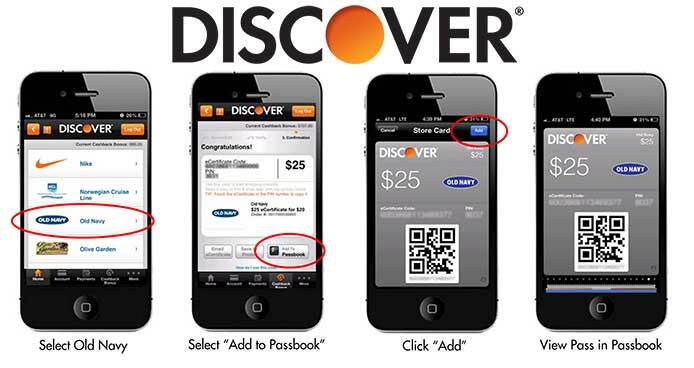 Discover becomes the first company to utilize Apples Passbook to focus on credit-card rewards. American Express currently offers a Passbook-enabled app, but there are not yet any rewards capabilities. Passbook  released to the public alongside iOS 6 on Sept. 19 with the intended purpose of housing coupons, boarding passes, tickets and various forms of mobile payment  has steadily been adding integration with other apps. In the past week, real estate company Re/Max unveiled an updated version of its app that would allow agents to keep digital business cards in Passbook, and Google added Passbook support to iOS app for Chrome, its Web browser. And in mid-November, Apple itself changed its Apple Store app to add Passbook-ready digital gift cards. Some early adopters of Passbook functionality have included companies such as Amtrak, Delta, Starbucks and Target, which allows users to present store coupons via Passbook at the time of purchase. Other new features available in Discovers update include the ability to make payments and search transaction history, send cash to people using PayPals Messenger and refer friends to Discover to earn extra rewards.